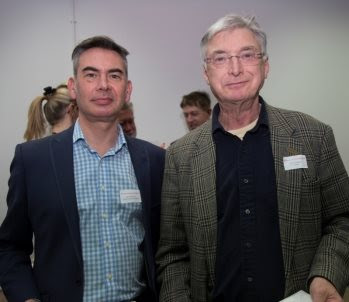 Last week business leaders from Accrington and districts met at The Globe Centre, with guest speaker Stuart Nevison, Chairman of Globe Enterprises Ltd. 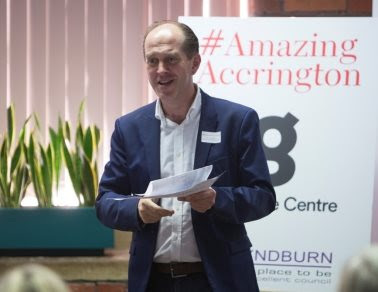 The #AmazingAccrington initiative allows influential business leaders to meet, learn more about the exciting developments in the borough and discuss the importance of supporting the community. 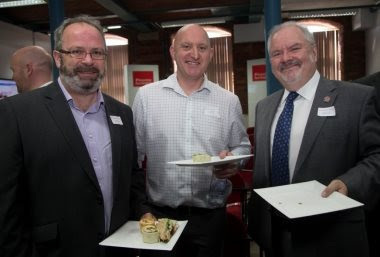 Many influential business leaders were present, including Andy Holt, owner of Accrington Stanley Football Club and David Welsby, CEO of Hyndburn Borough Council. There was a real buzz in the room with congratulations and excitement surrounding the recent news, Accrington Stanley gaining promotion to League One for the first time in history. The room was filled with a round of applause for Andy Holt to start off. 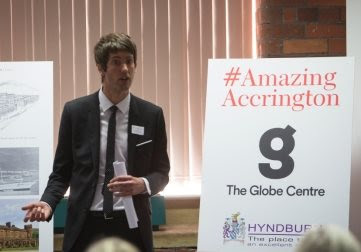 Murray started with a brief history of The Globe Centre, which is currently a modern business hub, actively bringing businesses to the area. Guest speaker, Stuart Nevison, Chairman of Globe Enterprises Ltd, which has seen the success of The Globe Centre in Accrington, bringing jobs, regeneration and business to the town. Stuart was one of the original founders of AMS Neve, a company which has created audio equipment used on films such as Skyfall, Black Swan and Toy Story 3- these products continue to be prominent across the world. 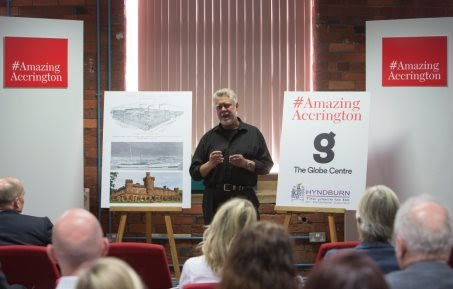 Stuart gave an inspirational talk to the #AmazingAccrington business leaders, detailing his own business journey and the worldwide importance of his audio products, that were born in East Lancashire. His journey continues through offering a platform for expansion and networking in The Globe Centre, a focal point of the town. Steven Cochrane, Director of Growth Lancashire Ltd.
David Welsby, CEO of Hyndburn Borough Council, updated the group on future regeneration in the borough. He focussed on land and investment opportunities, including current expansions of businesses in the area. “There are excellent spaces here in Hyndburn. For example Altham, The Globe Centre and Frontier Park. where the owners, Eurogarages, are developing a 90 acre mixed use site that is available for companies which are looking to relocate into the area or existing businesses that need space to expand. 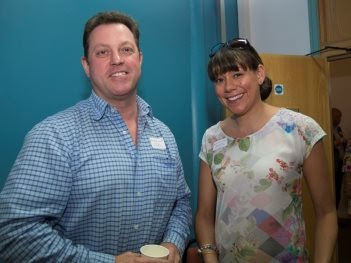 Stuart Rogan, Managing Director of HML Recycling and Astrid Stevenson from Moving People Ltd.
Steven Cochrane, Director of Growth Lancashire Limited spoke to the group about the work the company do and opportunities for business in the area. Murray Dawson finished by highlighting the upcoming events in the borough, such as the family-friendly music festival in Accrington on the 5th May and the Soapbox Challenge, sponsored by Emerson and Renwick on the 1st September- businesses are encouraged to lead the way by entering their own team!